I've been scaring people at the gym a little this week. I agreed to be part of a reading called Love, Loss and What I Wore, which is a collection of scenes and monologues about women and their clothes. It sounds fluffy--and it kind of is--but there is some truth to the idea of that we are what we wear (as well as what we eat). But back to scaring people at the gym--I have been running lines while on the elliptical machine. Mind you, I'm not saying them out loud, but I'm reading and thinking through them, and gesture a little like I plan to do in the show. I don't act much anymore, since I keep getting offers to direct shows. There are two problems with getting back onstage after spending a couple of years sitting in the audience giving others direction. First, acting is terrifying when you haven't done it for a while. It is no easier when you're onstage with actors you admire who are capable of making anything funny. The other four women in this show are a formidable, talented bunch. This also means I'm not home to cook every night, which I was kind of getting used to before I agreed to do the show. Monday night was my last night off before I plunged into a week of rehearsals, as well as being the last evening of a three-day weekend, so I wanted to make something special. And, make no mistake, this pasta is special. 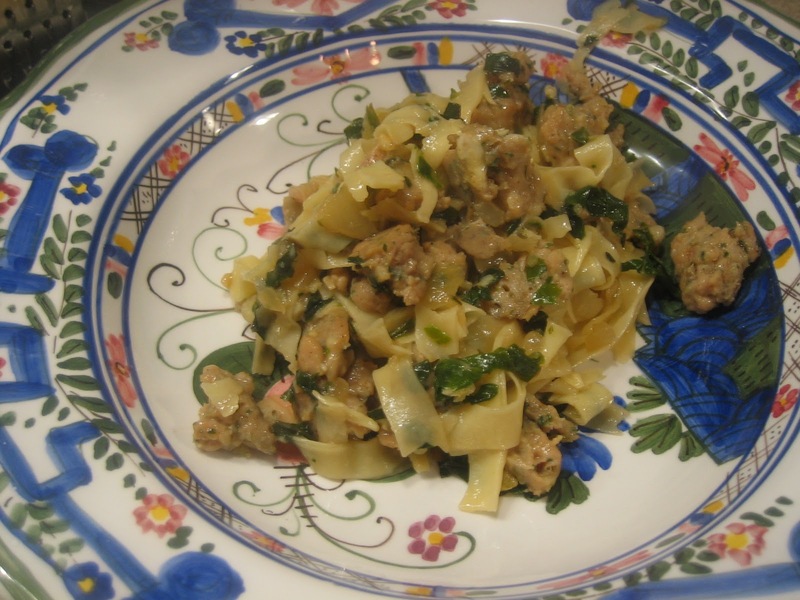 Slightly spicy, full of wilted dark leafy greens and thickened with toasted bread crumbs, the sauce is a winner. 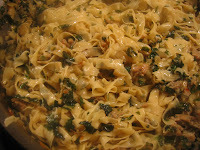 David made homemade linguine to eat with it, but good-quality dried pasta will work just as well. Wash and dry the kale. Cut the leaves away from the stems and chop the stems into 1/2 inch pieces. In a large, deep skillet, heat the quarter cup of olive oil over medium heat. 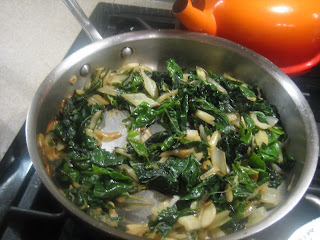 Add the kale stems and cook for two to three minutes, or until they are softened. Add the onion and garlic and sprinkle with a small amount of salt. 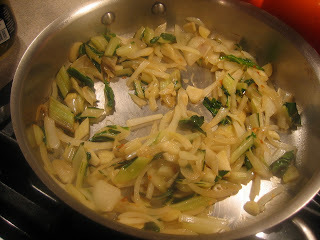 Then add the water and cook this mixture until the vegetables are thoroughly tender but not mushy, about ten minutes. You will need to stir this mixture as it gets to the end of the cooking time to prevent the vegetables from sticking to the pan. 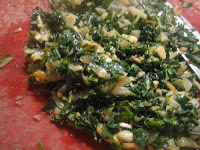 Add the kale leaves and cook for an additional one to two minutes, stirring them into the stem mixture. Then reduce the heat to low and cook this mixture for another fifteen minutes, stirring occasionally. The mixture is done when it is very soft and thoroughly wilted. Empty the skillet onto a cutting board and allow the vegetables to cool. 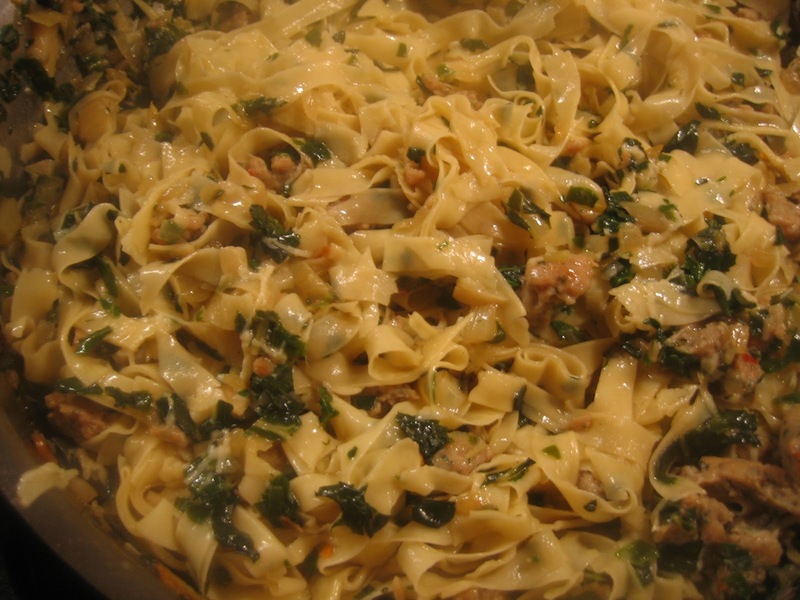 Start the pasta water at this time; if you are using dried pasta, cook to al dente; if you are using fresh pasta, it will only take a minute or to to cook. Using the same skillet, heat it over high heat, add the tablespoon of olive oil and then add the sausage. Allow it to cook without being stirred for about two minutes, or until the sausage is thoroughly browned. Then stir the sausage, breaking it apart into even smaller chunks, reduce the heat to medium and cook for another four minutes. I added a bit more onion to the sausage, but this isn't necessary. While the sausage is cooking, chop the kale mixture very finely. You will use most of it in the pasta, but we served the leftover vegetables on the side--they taste like a steakhouse creamed spinach dish, but way healthier. 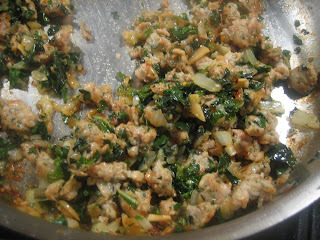 Add 3/4 cup of the kale mixture to the sausage and stir to combine. Add the peppers and cook for another two to three minutes, then add the stock and reduce the heat to a simmer. You will need to stir often to prevent the sauce from sticking. Add the tablespoon of butter, sprinkle in the cheese and stir to combine these ingredients with the sauce. Add the bread crumbs and stir again--you should have a lightly thickened sauce. Toss with the pasta to combine. Add salt and pepper to taste. The reading sounds super fun! Keep us updated!!! I absolutely love kale! Throw in that pasta & olive oil, and I'm game! Yes, this looks like an incredible pasta dish. I'm sure your jitters will disappear once you're on stage...let us know how it goes! Just keep them guessing at the gym. I would get progressively more expressive and louder as you sweat. Give them all something to talk about. I have been looking for some kale recipes beyond soup. I appreciate getting this one. I can picture you gesturing and freaking people out. I used to sing sometimes without knowing when I ran on the track at the gym. I always knew when I did it cuz my friends would be chuckling. We also used to call out how many laps as we went by, but Okay this is long winded now so yah for the gig and kudos for the pasta. Lol! I do love kale but not sure if everyone at my home would eat it in pasta. I can't imagine myself talking in public and there is no way for me to show up in front of a lot of people. You are amazing! Keep us updated! Yum! This pasta has REALLY good nutrition! I think this is the best recipe that I found using kale! this pasta is just fabulous! love the use of kale! The pasta looks amazing, but I have no doubt that when they asked you to do this part that they picked someone amazing, too! You'll be GREAT and if you were talking to yourself on an elliptical - I'd probably hop on one next to you to see what you were saying! Since its like a off period at work, I am able to prepare meals at home but when my peak time hits, I am also struggling. However, since my hubby travels most of the 5 working days, I try to make something simple and easy, so its noodles, eggs with bread or fried rice. When I saw the word spicy, happiness it was for me, I think by now you that we are on top when it comes to spicy food and suppose its already in our blood and difficult to be separated. I will simply enjoy this pasta and with the kale, its really tempting. Sounds fabulous! Love the Italian chicken sausage. And i'm cracking up at the sight of you running and rehearsing at the same time. You'd make my DAY if I was on the machine next to you! Great idea to do double-duty and get your workout in while you rehearse! This is a hearty meal, and one I'm sure my husband will love. First, I want to read that play - when I'm done with my small-all-woman-play. After I started directing, I acted only once. Pure terror - in a way that didn't exist when I was acting fulltime. 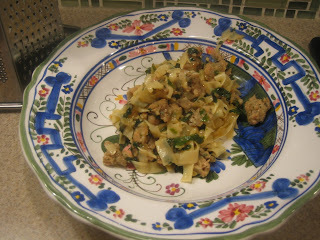 And your pasta - will be making it - love the combination of sausage and kale and often put them together. Getting back to acting sounds like my playing piano solos. I haven't done it much in the last few years, not like I used to that's for sure, and these days I find that my palms sweat and my stomach is a mass of butterflies. Still, I make it through and so will you. I am sure it will be a fabulous performance. Lol @ you reciting lines at the gym on a treadmill :)! This pasta sounds so hearty and healthful! I love kale and ate a huge pile of it tonight myself. Have a wonderful weekend :)! I'm sure all that line recitation will pay off and you'll be a smashing success! Good luck with the rehearsals. You'll soon get back into it. Meanwhile, I love that your busy life is inspiration for dishes like this lovely pasta to keep you nourished, prepared in no time at all. I love pasta dishes like this! We had a kale and pasta dish just last night. Your recipe sounds wonderful!